Changing someone’s mind is never easy. Our brains are wired to tightly hold on to our beliefs, preferences, and opinions, even the stupid ones. After all, 25 percent of Americans believe the sun revolves around the earth. Rapper B.O.B. believes the earth is flat. We call people like that a few sandwiches short of a picnic. But, try changing their minds. I mean, just try. I used to believe that football was great (greater than baseball, even). I didn’t know that players were being permanently maimed and brain-damaged by the sport. I didn’t know that the National Football League (NFL) was complicit in this damage by covering up the dangers of their sport in an effort to pad their coffers and protect their billions at the expense of their players. Football is a violent and deadly game. The National Football League is a greedy, criminal, and negligent organization. I have changed my mind about football. And, I haven’t watched a game since. I won’t be party to a game that sacrifices the health and welfare of their players in the name of sport. I am, pretty much, a boycott of one. I don’t pretend that I can change anyone’s mind about football, one of America’s most beloved pastimes. Super Bowl 50 – or Super Bowl L if the league used its traditional Roman numeral system – is Sunday and more than 100 million will watch it. Let’s get the big one out of the way – CTE (Chronic traumatic encephalopathy), the degenerative permanent brain damage that comes from repeated brain trauma, including the concussions and minor concussions that football players at all levels of the sport are subjected to. Symptoms include memory loss, dementia, aggression, depression, tremors, erratic behavior, and suicidal tendencies. While other athletes in contact sports have been diagnosed with CTE, it is most commonly found in football players. In any given season, 10 percent of all college players and 20 percent of all high school players sustain brain injuries. Brain injuries result in more deaths than any other injury in sports. Each year, doctors treat 389,000 musculoskeletal injuries in football players aged five to 14. Studies show an “epidemic of extensive neck and head injuries,” including concussions and football-related traumatic brain injuries (TBIs), which can lead to, among other things, memory problems, concentration issues, speech impediments, and headaches. Research by the Department of Veterans Affairs and Boston University on deceased NFL players released last September revealed that more than 95 percent of players studied – 87 out of 91 – tested positive for CTE. Scientists recently discovered that the human brain can fully process an image that has been seen for just .013 seconds. In comparison, it takes .4 seconds for a 91 MPH fastball to go from pitcher to catcher (assuming it actually makes it to the catcher and doesn’t end up in the bleachers … but you get the point). 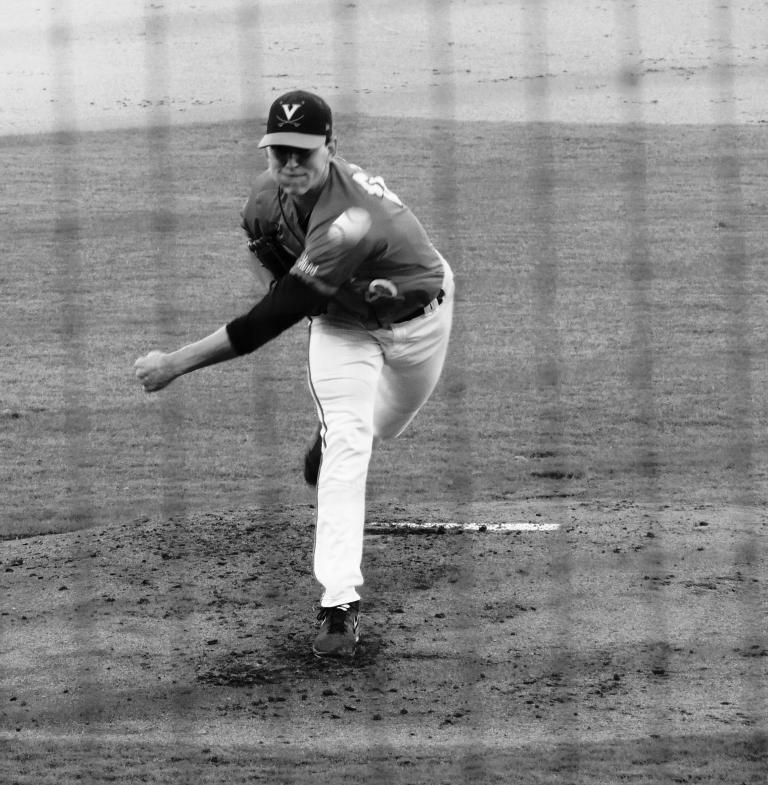 In the time it takes a young college pitcher to wing his fastball over the plate, my brain will process some 30 images. Including this one from the University of Virginia during the Cavalier’s “Fall Ball” season last October. In .013 seconds, your brain processed the image. So, how many major league scouts with radar guns did your brain see? This concludes your brain test. 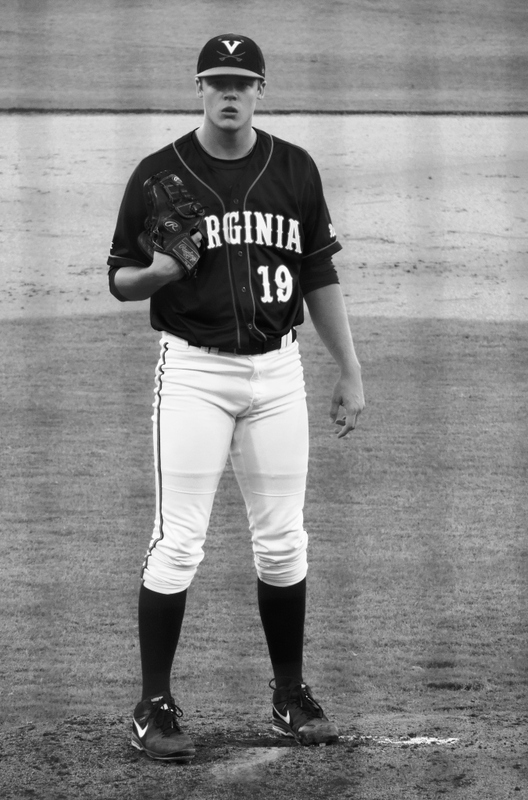 These photos were taken on October 5, 2014 in Charlottesville, Virginia at UVa’s Davenport Field. The pitchers the scouts had come to watch and clock — Juniors Nathan Kirby and Brandon Waddell. Both lefties. Everyone loves a lefty. UVa Junior and Pre-Season All American Nathan Kirby. UVa Junior and Pre-Season All American Brandon Waddell. Just 14 days until the start of the NCAA baseball season.